When I first played Mulaka at E3 2017, the word that kept coming to mind was simple: unique. The unfortunate truth is that there are simply not many video games out there that use Latin American culture to inform the world that a game protagonist inhabits. Lienzo, the development team behind Mulaka, is a studio based out of Chihuahua, Mexico that has created a game that is heavily inspired by and derived from the lore, the landscapes, and the people of the Tarahumara (also known as Rarámuri) culture local to Lienzo’s area. Mulaka is armed with a spear weapon. (Image courtesy of Lienzo). In my demo, I played as the titular Mulaka, a Sukurúame (A Rarámuri word for ‘shaman’ or ‘warlock’), who is both capable of interacting with the gods themselves and fighting down mystical creatures that were drawn from the Tarahumara culture. I played a very-early build of the game’s third level, and I was quite pleased with what I found. 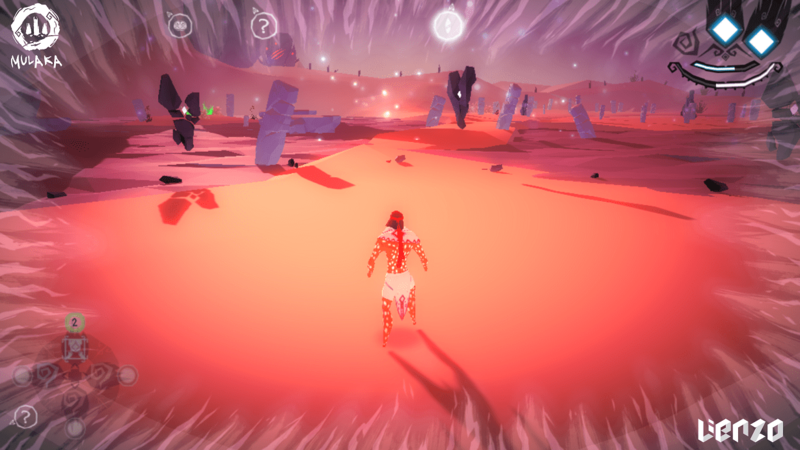 The red swirl overhead is the creature’s health bar, as Mulaka attacks it. (Image courtesy of Lienzo). There are often multiple enemies to fight, all of which are inspired by the Tarahumara culture. (Image courtesy of Lienzo). The core of this game is that it is a hack-and-slash title that is also mixed with some light puzzle solving and platforming. The game atmosphere, as you can see from the screenshots included in this article, is colorfully vibrant and bold with its own art style that manages to stand out among most indie fare. One element that really stood out to me during my brief demo time with the game, however, was that I was able to transform my character to fly across gaps as a bird (using up a magic meter that replenished itself when I would transform back). In the game, this is known as Mulaka’s divine transformation, which was called E’Lawi’s Blessing. Additionally, I was able to activate a viewing mode akin to the Batman Arkham franchise’s Detective Mode or the Assassin’s Creed franchise’s Eagle Vision that changes how my Sukurúame views the world to solve puzzles by both making the world atmosphere darker and by subsequently highlighting keys to various puzzles that I would come across. Even the amount of lives you get is steeped in Taruhumara lore: A man is said to have three souls (and women four), which is why Mulaka has three lives as seen in the top right corner. (Image courtesy of Lienzo). Overall, I was impressed with Lienzo’s early efforts, and I am curious to see what Mulaka has in store to tell about both the Tarahumara people of Mexico and about Mulaka himself as he works to unite various demi-gods to work together to save humanity before the world is destroyed by the gods in retribution for the wickness created by mankind. This game is currently scheduled for release on PC, Xbox One, and PlayStation 4. What do you think of Lienzo’s game? What do you know about the Tarahumara culture? Let us know in the comments below!